Mission critical 8K modular media server. 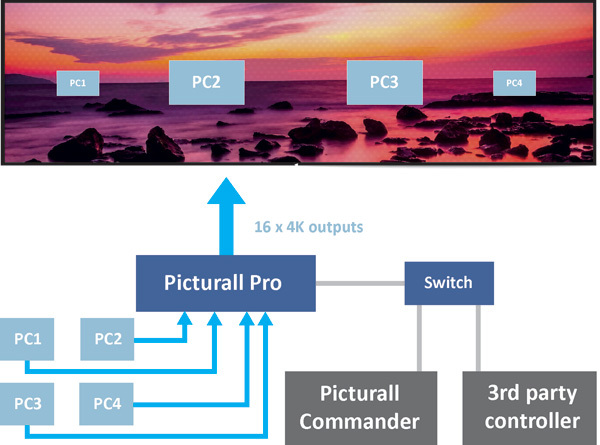 With the ability to playback media beyond 8K resolution and to drive up to 16x 4K@60Hz 10-bit outputs from a single server unit, the Picturall Pro media server is the true powerhouse in massive LED video wall installations and large corporate events. For its 12th Annual Meeting, Congress Rental chose a Picturall Pro media server to projection map the Plaza de Toros (bull ring) in Colonia del Sacramento. The ultra-stable and ultra-high quality Picturall Pro was the 100% trusted equipment for this challenging mapping, seen by some 8,000 viewers on the street. Analog Way partnered with Digital Projection, Inc. (DPI) to showcase DPI’s new INSIGHT LASER 8K projector at InfoComm 2018.